It’s that feeling you get when you hear your favorite song, or when you’re at a concert with a chest-pounding beat and you just can’t help but dance. The power of music is a mighty thing. And it’s being harnessed to treat physical and mental illnesses in schools, hospitals and clinics in Salt Lake City and nationwide. Music therapy is designed to improve patients’ lives by addressing specific therapeutic goals—from managing pain to improving mood. 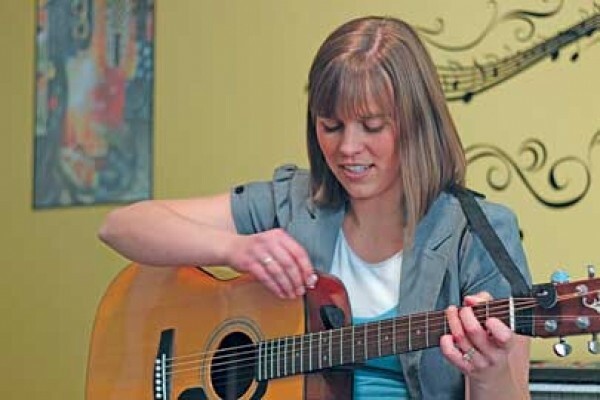 A music therapist might be in a neonatal clinic, humming softly to premature infants to introduce them to auditory stimuli; in a rehabilitation facility, encouraging a patient to play a song that allows for expression of feelings about drug addiction; or in a hospital room, helping a stroke patient sing words that he can no longer speak. Music’s ability to heal is remarkable, especially from a neurological standpoint. According to an article titled “A Neuroscientific Perspective on Music Therapy” by Stefan Koelsch, of the University of Sussex, “music listening (and music production, to an even greater extent) activates a multitude of brain structures,” allows full access to healthy parts of the brain and even facilitates the formation of new neuropathways. Because it’s a relatively young discipline, not everyone appreciates the skill and rigorous training required to become a music therapist—from studying music theory and history to statistics and anatomy. “A lot of people just think, ‘OK, I can play an instrument and I can go to a hospital and I can sing or I can play my violin, and it really helps people feel better, therefore, that’s music therapy,’“ says Maureen Hearns, director of the Music Therapy Program at Utah State University. For this reason, Utah-based music therapists are committed to obtaining licensure. The American Music Therapy Association and The Certification Board for Music Therapists, as well as local task forces, are currently working to achieve licensure in the 48 states where there is none (North Dakota and Nevada implemented licensure legislation in 2011). Music therapy utilizes four experiences to reach goals: performing, composing, improvising and listening. Jaycie Voorhees, director of Harmony Music Therapy, works with children with mental and physical disabilities, such as traumatic brain injuries, developmental disabilities and autism. An example of the therapy at work: One of Voorhees’ clients, a little girl, would throw any object given to her. “That kind of hinders a lot of her learning if they’re working on art or anything where she’s required to hold things,” Voorhees says. Because the client loves music, though, Voorhees worked with her by having her play handheld instruments, and songs gave her a reason to hold the object. “She’s grown from holding onto things for one to five seconds, up to five minutes now,” Voorhees says. The scientific evidence is piling up in favor of music therapy, and more institutions are incorporating it into their therapeutic repertoires. Forever Young Foundation plans to develop a new music therapy facility, Sophie’s Place, at Primary Children’s Medical Center, according to the foundation’s website. It’s estimated to launch in February or March 2013. Sophie’s Place will include space for both individual and group therapy, as well as a recording studio.